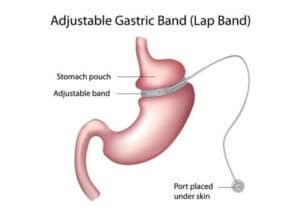 There are two main gastric bands approved by the FDA: Lap-Band Gastric Banding System and Realize Gastric Banding System. The FDA approved this system for adults over 18, who have a BMI of at least 40. The FDA approved the system for BMIs of 30 through 40, as long as they have a comorbidity, such as hypertension, diabetes, heart disease, etc. The Realize Band is very similar to the Lap-Band system, which was invented much earlier on. The realize system works in the same way to restrict some calories consumed. 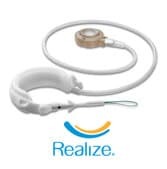 The FDA approved Realize Band is for patients who are morbidly obese, with a BMI of at least 40. It is also recommended for patients with a BMI of at least 35 with one or more obesity-related medical conditions. The Band is indicated for use only in adult patients who have failed non-surgical weight-loss alternatives, such as supervised diet, exercise, and behavior modification programs. 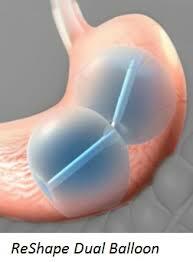 The ReShape Dual Balloon is a device that occupies the space in the stomach. By restricting this space, the patient should consume less food and thereby lose weight. The device itself consists of two balloons attached, that are filled with about two cups of saline and blue dye (allowing the patient to see the rupture of the balloons when urinating visually). The balloons are typically placed for up to six months. The device is used in adult obese patients who have a Body Mass Index (BMI) of 30-40 kg/m2 who have been unable to lose weight through diet and exercise. Patients must also have one or more obesity-related conditions such as diabetes, high blood pressure, or high cholesterol. Reshape Dual Balloon is intended to be used while a patient participates in a diet and exercise plan supervised by a health care provider. The ORBERA Intragastric Balloon System is a weight-loss system that uses a gastric balloon that occupies space in the stomach. The Orbera balloon is similar to the ReShape Dual Balloon system. This temporary procedure is placed under mild sedation endoscopically. The single balloon can be filled with 400 to 700cc of saline – best matching the body structure of the patient. 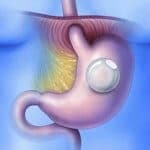 Obalon is the latest approved weight-loss treatment device, which uses a swallowable capsule that is attached to a thing inflation catheter. Once in the stomach, the capsule opens, and the balloon is filled with air via the inflation catheter. The benefit of the Obalon Balloon system is that up to three separate balloons can be placed in the stomach for six months. Each balloon has the capacity of each 250ML. After the treatment duration, the balloons are removed via an endoscopic procedure. The device is used to treat adults with obesity who have a Body Mass Index (BMI) of 30-40 kg/m2 and who have been unable to lose weight through diet and exercise. The Obalon Balloon System is intended to be used while a patient participates in a moderate intensity diet and exercise program. The AspireAssist is a device that helps patients lose weight by removing approximately 30 percent of calories consumed. The device uses a draining port connected to the inside of the stomach; this port is thereby attached to the outside of the abdomen via a Skin-port. 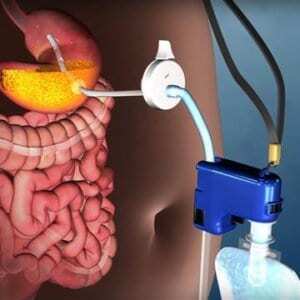 Approximately 20-30 minutes after eating, the patient connects the external components including the Companion, connector, tubing, and water-filled reservoir, and drains the stomach’s contents. The patient then flushes the stomach with water by squeezing the reservoir and draining the stomach again. This device is not intended for patients with prior eating disorders, including Bulimia, Binge Eating Disorder, and Night Eating Syndrome. Patients will be monitored throughout, for the development of potential eating disorders. This FDA-approved device is for a particular patient subset, those who have failed to achieve and maintain weight loss with non-surgical weight loss techniques. The device is intended for long-term use in conjunction with continuous medical monitoring and lifestyle therapy to help patients develop healthier eating habits and reduce caloric intake. The Maestro Rechargeable System is a device to treat obesity by blocking the nerve activity between the brain and the stomach. The device consists of a rechargeable electrical pulse generator, wire leads, and electrodes. The exact mechanisms that allow the Maestro Rechargeable System to induce weight loss are unknown. 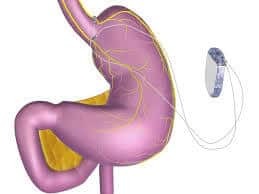 The device works by sending intermittent electrical pulses to the vagus nerve (which is involved in regulating stomach emptying and signaling to the brain the stomach feels empty or full). The Maestro Rechargeable System is an electrical stimulator that is surgically implanted into the abdomen to block nerve activity between the brain and the stomach. It consists of a rechargeable electrical pulse generator, wire leads, and electrodes and is used to help people who are at least 18 years old lose weight. External controllers allow the patient to charge the device and allow healthcare professionals to adjust the device’s settings to provide optimal therapy with minimal side effects. The FDA approved the Maestro Rechargeable System for use in obese patients who have failed at least one supervised weight management program within the past five years and who have either: a Body Mass Index (BMI) of 40 to 45, or a BMI of 35 to 39.9 and one or more obesity-related conditions, such as diabetes, high blood pressure, and sleep apnea.